Do you like shopping online but mind the idea of spending a lot of money for postage? In that case we have a great message for you! You can buy your favorite products with us and we will send it to you for free. You only pay for the selected goods – watches, perfumes, purses or hair cosmetics – without any annoying packing and shipping fees. Do not hesitate any longer and enjoy free shipping on a huge number of selected products. Michael Kors, American love of most women and girls, has become one of the biggest icons in the fashion industry over the last couple of years. His fashion style respects all needs of a modern woman – to look amazing, to feel great and to be happy with herself. The highest demand is mainly for his fashion watches, handbags and purses. These are made in the spirit of "minimalist maximalism" which is what appeals to the world so much. Most fashion accessories coming out of his workshop are linked with a seeming simplicity in both materials and colours. Women's Michael Kors watches are mostly all-metal – covered in gold, rose gold (currently very modern) or silver. They fit your hand perfectly and beautify you at work, at a party or at a café with your friends. The MK handbags are mostly black. Why are they so popular then? Certainly because his fashion accessories are universally combinable with almost every piece of your existing wardrobe, yet radiate unmistakable luxury. Even men can make themselves stand out with one of the Michael Kors’ treasures. There are fewer men’s watches than women's in our offer but you still will not be able to decide which one you like most. Daniel Wellington watches are extraordinary for a number of reasons, not least of which is the fact that they do not bear the name of their founder, Swedish businessman Filip Tysander, but of someone who is not even linked to the company itself... Tysander met a British gentleman, Daniel Wellington, in 2006 while he was "halfway through a journey around the world". Tysander was fascinated by Wellington, a charming man, the embodiment of style and charm. One thing in particular caught Tysander’s attention: his watch – classic, apparently vintage, worn with a NATO strap... Simple, unimposing yet still it made an incredibly elegant and extraordinary impression. Tysander thought to himself "This is the kind of watch people should wear! ", and started producing them in 2011. 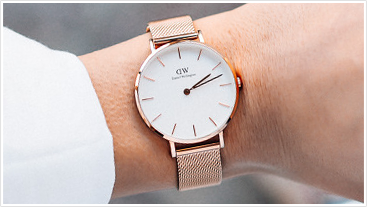 It is the combination of old and new that makes Daniel Wellington extraordinary. A classic analog watch with round dial offering the possibility to change the straps anytime surely makes many fashion lovers happy. It is a perfect accessory for every occasion. The company has been hailed the Europe's fastest growing business in 2017. Its success also goes back to a prolific use of social media and Instagram. The fans mostly appreciate the DW watches for their timeless design.